Using gliding exercises for upper body strength training can enhance your body-mind connection. They will strengthen your body, your core power and allow your soul to glide! I have written about gliding discs and how they can be used to add spice to your intuitive movement. Gliding can be fun as well as strengthening for your entire being, body, mind and soul. The use of gliding discs can help you break out of your old physical patterns, and find a new way of being. When you do your gliding exercises, it is very important that you select the correct type of gliding discs. If you will be working out on hardwood, select the fabric ones. If you will be working out on carpet, you need the plastic ones. In this article I discuss gliding exercises for upper body strength training. (I also have a complete work out using gliding exercises for lower body strength training as well.) Upper body strength straining through the use of gliding discs will strengthen your core as well. I return frequently to the subject of the "core of your being" as discussed in core exercises. To understand the deeper meaning of the exercises, I strongly urge you to first read my article on Gliding Discs. I talk about using gliding discs to transform your habits. If you perform your gliding workout in a meditative fashion, where you initially move your physical energy, the subsequent changes in your emotional, mental and spiritual energy is inevitable! Gliding along is a wonderful way to incorporate your body as a powerful tool to transform your life in all its aspects of the body-mind-soul. It is using your body-mind connection in an optimal way! It is so easy to become stuck in our routines of everyday life. We have so many demands on us that we forget our inner creativity, our inner voices that long to sing! For me, using my body to transform me into that space of quiet, hope and peace is my favorite activity. When I have trouble getting motivated to do anything, I discover that if I move my physical body, somehow the rest of me comes along. This intuitive movement is a way to mobilize myself ~ my body first, then my mind and soul. Just like you, I still need to be attracted to new things. I am always looking for ways to take me somewhere, where I have not gone before. The gliding exercises fulfill this purpose for now. Almost everyone I have shown the gliding discs are attracted to it; their simplicity, their fun, and the ability to become like a child again. They put on the discs and the smiles begin! Even my 85 y.o. mother-in-law loved it, as you can see in Gliding Exercises for Seniors. My friends had great fun when they learned to dance and glide with the discs. So use your gliding discs as a moving metaphor for you life, to get it unstuck, to have fun, to go into your center of creativity, your soul. When you do your gliding exercises, affirm to yourself, "I am fluid and free." "I glide into my child-like creativity and re-discover myself." "My body transforms me to my inner voice and I sing!" Remember that all I offer in the gliding video is to be used as a reference only. Start slowly and learn the simple movements first. Then go where your heart desires. Move as your body wants! Let it be more intuitive, so you will love how you feel when you do the movements. Don’t go all out at first trying to prove something to yourself or anyone else. Just have fun and be free! The easiest gliding exercises for upper body strength training are done on your knees. 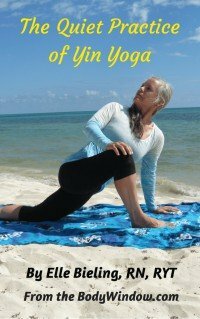 In the video, I am working out on a hard tile floor, so I use a folded yoga mat to soften the floor. If you are on padded carpet flooring, you may not need anything to do your gliding exercises. If you don’t have a yoga mat and need more padding, a folded blanket will serve the purpose well. When you start out, you may just want to hold the starting position in the first exercise in the video for upper body strength training. This is the plank position and if you have not done any yoga or other strength training lately, you may wish to assess how you feel after holding this position for a minute or so. The gliding discs make the position unstable, so it will increase the upper body strength needed than if you just do it on the floor. When you are ready (possibly days later), add the push-up with one arm, then the other. If this feels comfortable go ahead and try the two-armed push-up. When you watch the video, I think you can tell that this is difficult for me! I had to use all my focused energy to perform it. It is difficult! Make sure you plant your hands firmly in the center of the gliding discs and spread your fingers wide, with the middle finger pointing straight ahead like you do in yoga. This hand position gives you a firm base of support. To make the gliding exercise even more difficult, you will see, in the second clip I go from a position on my knees to my feet. This is the full plank position. Again, you may want to just hold the plank position, like I already described. This in itself is a good upper body strength training exercise. You will notice that when I do the push up in the full plank position that I can only do it one arm at a time. I can’t get near the two-armed push up! So guys, if you think gliding discs are for sissies, think again! Try this one. Let me know how you do! The easiest of all the gliding exercises is shown in the 3rd clip. Maybe I should have organized the video to show it first, but I like this one for different reasons. It is more of a core exercise. It addition, it is an easy upper body strength training exercise and it just feels good. You lubricate your shoulders by performing the range of motion ~ first forward, then in circles, followed by a mild push-up. You can feel where you truly may be stuck. If your shoulders click and stick, you may also want to view my foam roller exercises for the shoulder muscles. All of the moves that I show in the video will get your heart going for a great aerobic workout as well. May your body truly flow with fluidity and grace as you perform your gliding exercises. May your discovery of these gliding discs aid you in using your body as a tool to transform your upper body to be full of strength. It is my desire that when you do this moving meditation, that you will become unstuck and heal your body-mind-soul!